Bolete mushrooms, the common name for mushrooms in the Boletales order, cover an array of families and species. Depending on whether physical, chemical and/or DNA properties serve as the organizing tool, Boletales classification changes. For present purposes, the term bolete is used rather loosely to refer to mushrooms with pores rather than gills under the cap. 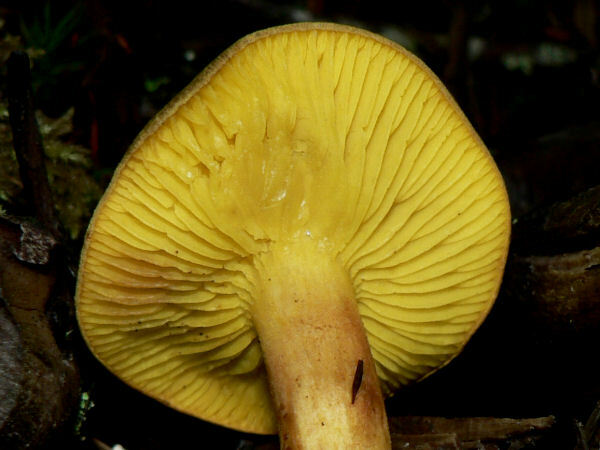 The article provides some representative species for a variety of mushroom genera/family. 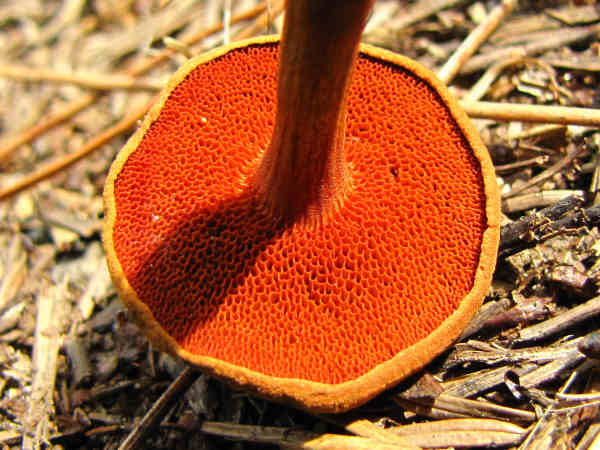 Species in the Leccinum genus often go by the common name scaber-stalks. The first two pictures show a mature mushroom and a close up of the stem that highlights the short, dark, hair-like projections. Scaber-stalks can pop up in residential areas as well as forested areas, whereever their associated trees, such as aspens and cottonwoods or birches, grow. Suillus, another large group of pored mushrooms, often are called by their nickname slippery jacks. North American hosts approximately one hundred sullius species, which often grow in association with conifers. 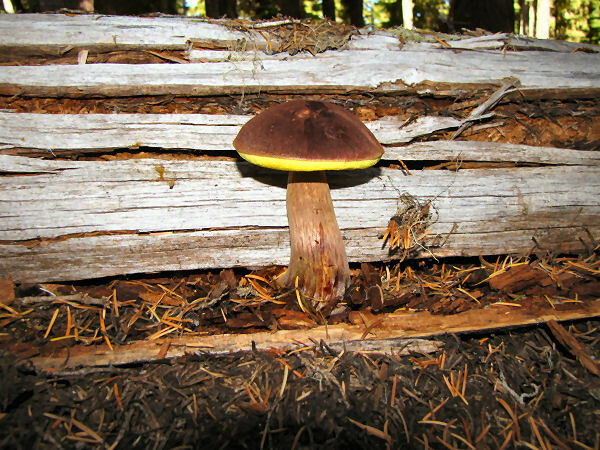 Most boletes fit the category of pored mushrooms. 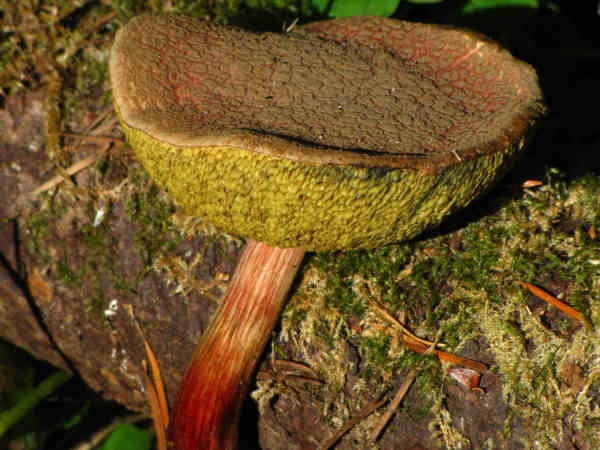 The Gilled Bolete (Phylloporus rhodoxanum) goes against the grain. A handful of Phylloporusgenus species grow in the United States, some bruise blue, others do not. The picture additionally highlights the bright yellow gills. Known for their colorful caps and stipes, along with a reddish spore print, Tylopilus species grow heartily in eastern North America. 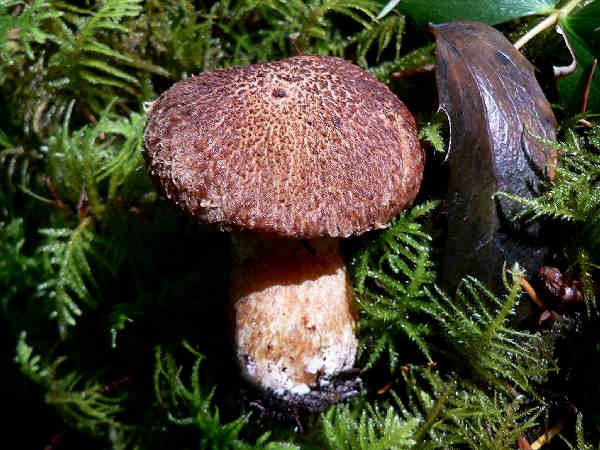 Tylopilus porphyrosporus, a less common Pacific Northwest species, stands out for its chocolate cap, stipe and pores. Many wildlife biologists became aware of its presence by documenting its existence on northern spotted owl territory. It grows in associated with a handful of pines. Peppery Boletes (Chalciporus piperatus) grow world wide in conifer forests. Mycologists often suggest caution in consuming them, however, the peppery, comes from its reputed taste. With a cap size often no larger than a dime or quarter, finding one might be a challenge. Look for a dull, often flat cap. The picture highlights the orange (to brown) Hymenophore, the better field identification clue. Most mushroom enthusiasts think Family Boletaceae when they think Boletales, with the Boletus genus receiving considerable culinary attention. 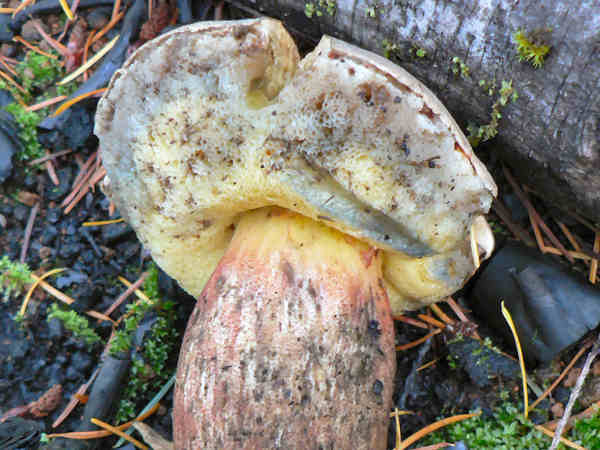 While many boletus species such as Boletus Edulis (Porcini or King Bolete) are prized for their edibility, it would be a gastric mistake to assume the edibility of all boletes or boletus species. Identifying the one hundred plus species begins by comparing their caps, pores and stems by their color and texture. In some instances, other field related identification clues help. The Admirable Bolete in the picture (Boletus mirabilis), for example, is a striking mushroom, grows on tree stumps. The pictures and information covering the following four species provide additional examples that base initial identification using cap, pore and stem comparisons. 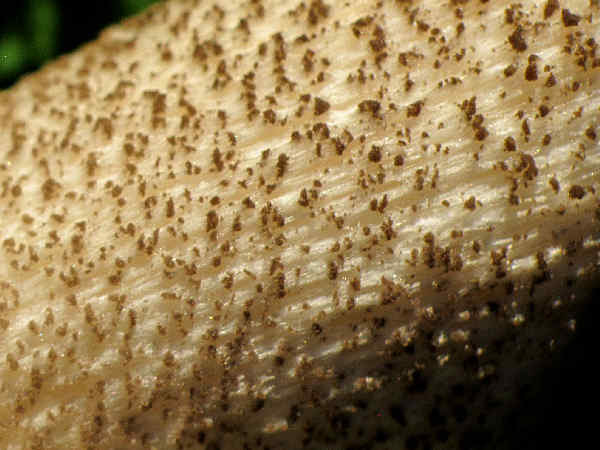 Cap and stem texture anchor help identify the Boletus fibrillosus in the picture. 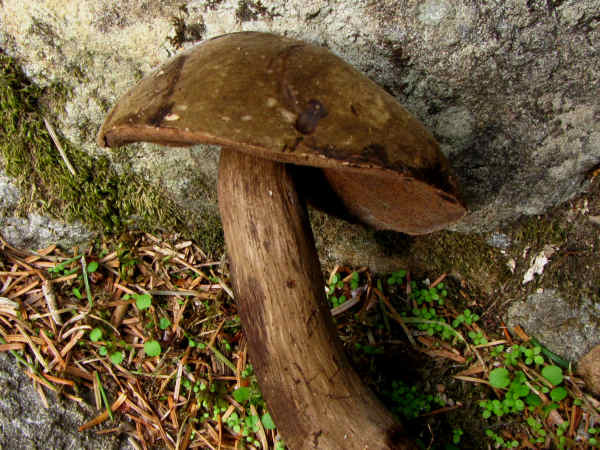 The presence of a reticulated stem can mean that a boletus is related to the best known bolete the King Bolete. It’s a West Coast forest species that grows in association with Douglas Fir. The wrinkled cap is also a good ID clue. A red and yellow color stem gives the Boletus smithi a colorful look. It’s another West Coast forest species that grows in association with many trees. 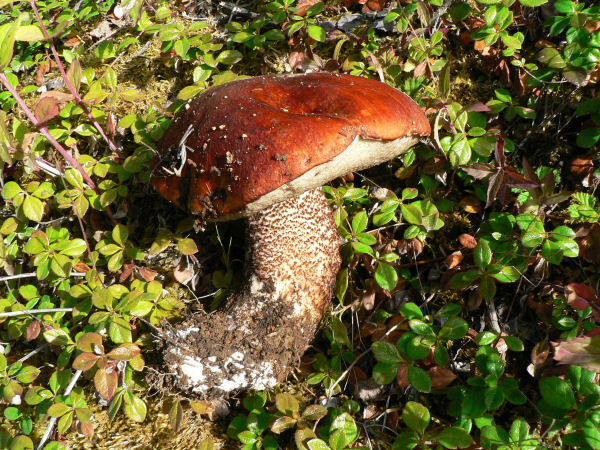 Some people nickname Boletus chrysenteron the red-cracked bolete because of the red stains that appear on the cracks of the cap as it matures. The picture shows some evidence of red staining in the cracks on the lower portion of the cap, suggesting B. chrysenteron. However, a definitive identification is not possible without a miscropic examination of the spores. Pores are known to bruise blue fairly easy, and this specimen was found in a group of similar species with bruises. 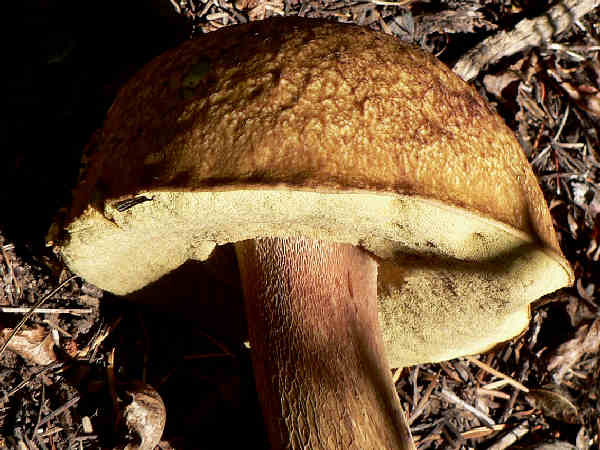 Red pored boletes grow in forest areas from coast to coast. On the East Coast, Boletus Frosti is the most common species, and a treat for mushroom enthusiasts to find and photography. Recently it’s been discovered (well maybe not that recently, if you are familiar with both the European and California material) that what we call Boletus satanas is different from the “real” Boletus satanas of Europe. If you do a comparison of European Boletus satanas with our local taxa you will find that the European material has a different coloration of the cap and lacks the abruptly bulbous base. Molecules confirm the difference. This means that we need another name for “our” Boletus satanas and leaves us with Boletus eastwoodiae (remember the type is actually “our” B. satanas). 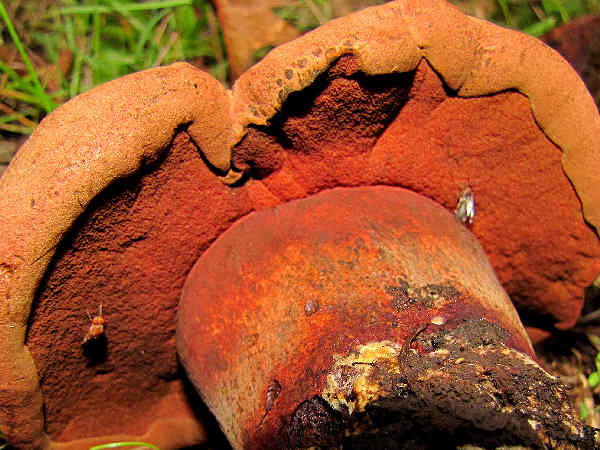 The picture shows a red-pored bolete that grew next to an oak tree, the tree family most associated with Boletus satanas. Given the current rethinking of classifying red-pored boletes, the identification of the specimen in the picture will tentatively be called Satan’s Bolete.